We are grateful to be part of multiple teams winning Aurora Awards at this years award presentation. The Aurora Awards are held annually during the Southeast Builders Conference (SEBC) in Orlando, FL at the Gaylord Palms Resort. We would like to congratulate everyone that submitted a project for this competition. We know teams worked very hard on all projects that were submitted. We would like to highlight a few of our clients. Farina & Sons, NWC Construction, Solstice Planning & Architecture, University of South Florida, ikon.5 architects, Harvard Jolly Architecture and Josh Wynne Construction. With our submission for the USF St. Petersburg College of Business we won a total of 26 Aurora Awards. We can not thank our clients enough for allowing us to be a part of these very special projects. Two Trails clients dominated all the sustainable categories this year. Please take a moment to look through the winners book below. who have made meaningful and significant contributions in the areas of business, health, education, entrepreneurship, science, sports, philanthropy and the arts. Debbie has been selected the winner for this years 2017 SRQ Magazine Hear Me Roar Competition. We could not be prouder of the accomplishments Debbie has made for herself and our company. Be sure to check out the profile the magazine published in the link below. USGBC Florida Gulf Coast's signature program LEEDership Award Program -- which annually is one of the best GREENworking events in the region -- recognizes and honors those outstanding projects, inspirational businesses, dedicated volunteers and individuals, and instrumental Chapter members who are LEEDing the way to a more sustainable built environment in the Florida Gulf Coast community. This year Two Trails won two awards along with a few other of our clients. Outstanding Green Business/Contractor: Rokop General Contractors, Inc. Branch Volunteer of the Year / Myakka River — Sara Kane –Josh Kane Two Trails Project Manager's wife. This Year Two Trails won a Grand Aurora Award and two Aurora Awards. We were delighted to be on multiple project teams with partner builders Josh Wynne Construction and Phil Kean Designs. Josh Wynne Construction took home the Golden Aurora Award for the Best in show. In total we were on projects that won 25 awards. Be sure to check out our video, winners book and the Harold Tribune article. Congratulations to all our clients that were recognized for their hard word this year the Southeast Builders Conference Aurora Awards. Please take a moment and check out the entire list of winners. We are very fortunate to have a wonderful group of clients and to be able to add more to that list every year. Two Trails and our clients had a great showing at this years' International Builders Show. We are proud to be on all of client build teams, but is especially nice to see our clients recognized by the industry for their hard work. Two Trails was again auspicious enough to be a part of the Design & Build team the 2016 New American Home put together by the NAHB Leading Suppliers Council. This years home was built by Element Design | Build. Please check out our project portfolio on the home here 2016 New American Home. The USGBC (United States Green Building Council) South Florida Chapter held their GalaVerde Awards Celebration at Hyatt Pier 66 in Fort Lauderdale on September 21, 2013. With over 75 applicants submitting for 17 awards in total, the judges for this competition had the regions top projects to select from and award the coveted awards. Some of the project categories included Public, Private, Single-Family, Municipal, Educational, Healthcare and Corporate. 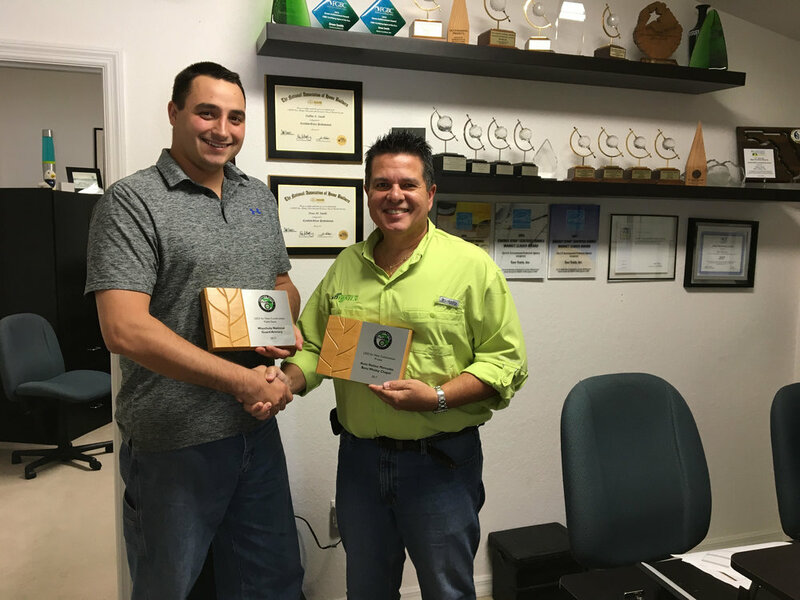 Two Trails client Matt Lahn owner of Florida Green Home Design Group won the USGBC South Florida GalaVerde Green Award for Most Outstanding LEED for Homes/Single Family for their work on the 2020 Alton project in Miami, FL. To our knowledge this project is the highest scoring LEED home in the nation with 120/80 points earned giving it a LEED Platinum designation. 2013 Aurora Awards: Two Trails Clients Received A Combined Total Of 37 Awards! The Aurora Awards are presented at the SEBC’s Black Tie Gala/Spectacular at the Rosen center in Orlando, FL on July 13, 2013. The Award competition recognizes achievements in building design. As a team member on many of the winning projects Two Trails Inc. is proud to be a part of the client teams that were nominated and won an Aurora Award.